A devastated woman has spoken about how she watched her soulmate die on the night of their wedding. 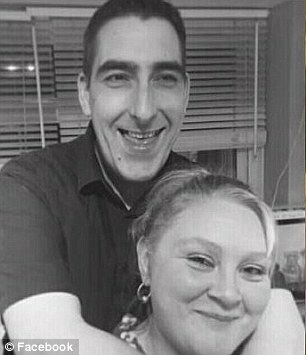 Just ten days ago Michelle White, from Lawrence Weston, Bristol, was living a normal life with her fiance, Scott Plumley. The couple, who had been together for two years, were in no rush to plan their wedding and were saving up little by little. 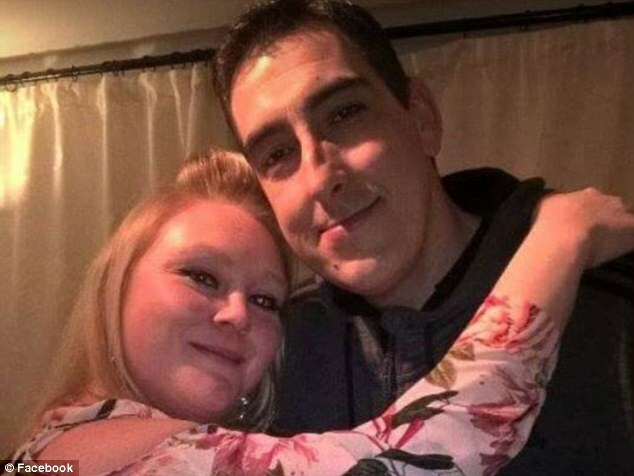 But now Michelle, 32, is frantically trying to raise enough money to cover the cost of Scott's funeral after he died from cancer, aged just 41. On Thursday 9th August, careworker Michelle returned home from her night shift and found Scott collapsed on the floor. She phoned for an ambulance, and Scott was admitted to Southmead Hospital on Friday morning. For the last month, Scott had complained of indigestion and had been prescribed omeprazole, a drug for treating stomach ulcers. However, an endoscopy alerted his doctors to the fact that it was much more serious. 'The consultant came in at around 4pm on the Monday to his bed at Southmead Hospital,' Michelle told Bristol Post. 'He said Scott had Stage 4 cancer of the oesophagus, and because they caught it late it had already spread to his liver and had destroyed that, and there was nothing they could do. 'I asked how long, expecting them to say 'a couple of months' or something, so I could bring him home, but they said 'no it will be weeks at most, in fact, it could be just days'. They said there was nothing they could do, no chemo or anything, just palliative care. 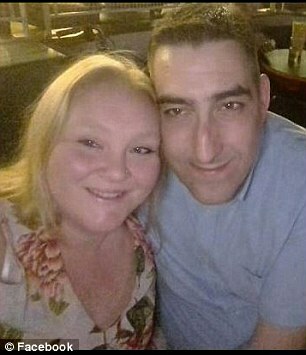 Michelle met Scott, who worked as a self-employed electrician, on an online dating site. She says they chatted for weeks before they met, but when they they finally did, the couple hit it off at once. Within the space of a few months Scott had moved into Michelle's home and taken on the role of father figure to her two young children. 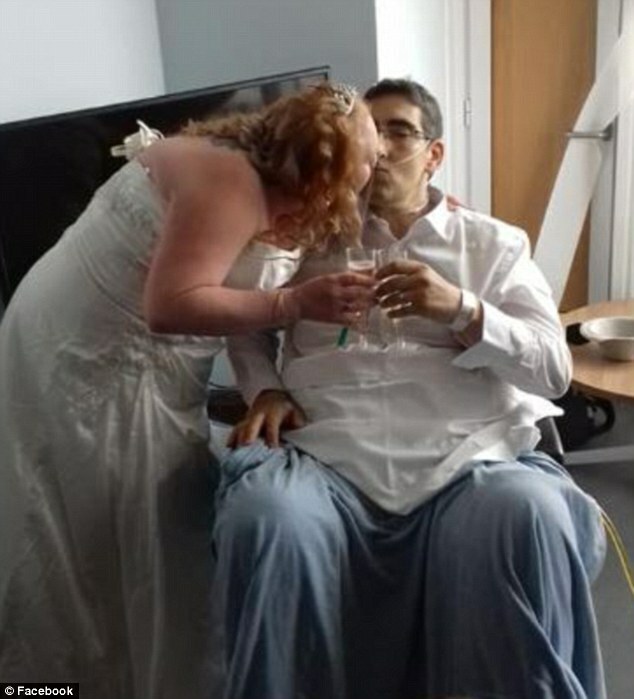 After his diagnosis on Monday 13th August, the couple knew that they wanted to get married as soon as possible. 'We were already engaged - we got engaged on the anniversary of us getting together - and we were planning to get married, saving up for it. I had a few bits and bobs bought for when the day came,' Michelle said. They explained Scott's situation to his family and friends, who travelled from all over the country to his bedside. 'Scott was born in Bristol, brought up in Hartcliffe, went to Withywood School and moved later to Stroud, lived in Gloucester for a time, and everyone all around knew him,' said Michelle. 'He was one of those people who everyone loved and was friends with. People from school came to see him, people from all over. Meanwhile however, Michelle had to start planning a wedding that needed to take place less than 24 hours later. 'We got to the Register Office in the city centre at 4pm on Tuesday, and got the Registrar to come to the hospital at noon on Wednesday,' she said. 'It was a massive rush. I literally had 20 hours to prepare and arrange a wedding. Everyone was so generous. One of my friends did the flowers, got a cake. One neighbour did my hair, it was amazing. 'I live in a block of flats in Lawrence Weston and it is a real community - when they heard what was happening, everyone came out and helped out,' she added. For the ceremony, Scott wore a shirt and trousers and Michelle wore a traditional dress and tiara. Scott was taken in his wheelchair to a quiet room on the ward where the couple's friends and family were waiting. 'He was so strong, really battling being obviously in pain,' said Michelle. 'He kept his sense of humour throughout - and he had a great sense of humour. 'He said there was no way he'd have any Prosecco, which is what we were toasting with, so we bought him a little bottle of Stella, and he had a sip or two of that,' she added. 'After an hour or so in the chair, you could tell it was getting too much - we've got a good 200 wedding photos! So he went back to bed for some sleep, and we all went to the Air Balloon pub for the wedding reception. 'The family and I returned later and we had a great evening by his bedside. He was so happy he managed to smile throughout the whole thing. 'He was a bit perkier that evening, and I was planning on spending the night there - they'd got me a reclining chair next to his bed, so I put my pyjamas on and settled down. 'His mum and sister stayed until about 11pm, and he was deteriorating fast. We knew it was coming to the end,' she said. 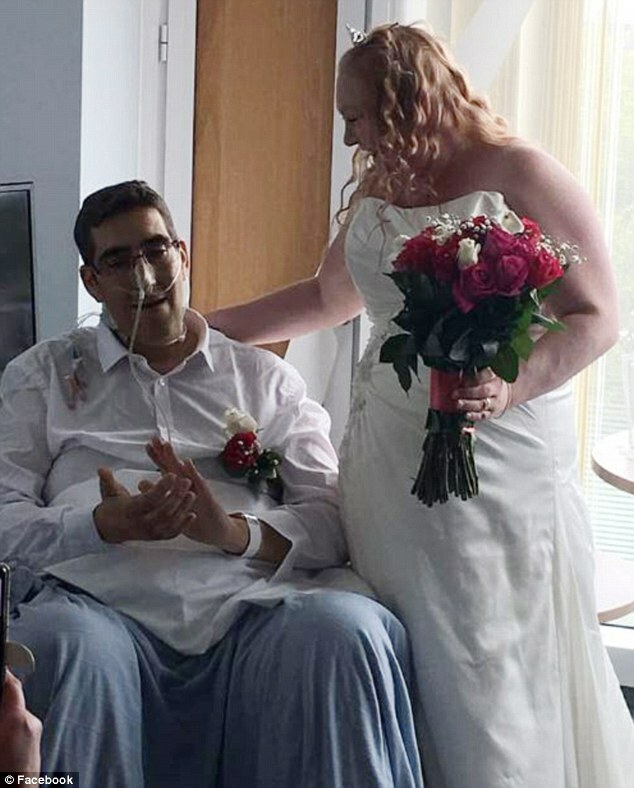 As midnight passed on their wedding night, Michelle and Scott shared their last hours together. 'He was uncomfortable, thrashing at his oxygen and being a right little bugger. But by 1.30am, he had settled down a bit. He was so tired from the day - it was a long and emotional day. 'I sat with him, holding his hand and he smiled, and kept saying he was sorry and 'I love you'. I was holding him and kissing him and he took three gasps of breath and I said 'it's ok baby, you can now, and get out of the pain',' she added. Shortly after 1.30am, Scott passed away - just 13 hours after his wedding. 'I've worked as a carer most of my life and I've worked in nursing homes and done palliative care, and as deaths go it was the nicest death,' said Michelle. Now, in the same week that she planned their wedding, Michelle is organising her husband's funeral. To help with the extra expenses, she has set up a GoFundMe page. Scott's mum Sue Dando had rushed to his side as soon as she heard the news. To donate to Scott's funeral fund, click here.